Cynical sword jockey-for-hire Eddie LaCrosse returns in a new medieval murder mystery drawn straight from the mists of legend in Alex Bledsoe’s entertaining third novel in the LaCrosse series (following The Sword-Edged Blond and Burn Me Deadly). Eddie is working undercover at posh Nodlon Castle on island nation Grand Braun to learn whether puffed-up Kenneth Spinkley, Lord Astamore, is cheating on his wife. It should’ve been a simple job, and it was—until someone murders one of fabled King Marcus Drake’s Knights of the Double Tarn with a poisoned apple. As if that murder weren’t bad enough, it’s clear from the circumstances that the bad apples—straight from Queen Jennifer’s orchard—were really meant for Sir Thomas Gillian, who is not exactly a fan of the queen. Court gossip hints that Jennifer and Drake’s favorite knight, Sir Elliot Spears, were lovers, right under the king’s nose. Could the queen have been trying to remove Sir Thomas, one of her most outspoken critics? Or is someone setting her up for the fall, hoping to drive a wedge through Drake’s court and shatter the hard-won peace that has defined his kingdom for a generation? Eddie has made his living knowing when to push and when to walk away. His gut tells him no matter what he learns here, the case won’t end well. But Marcus Drake wants the truth, no matter what it is, and the rumor mill is working overtime. Potential villains abound, from Drake’s half-sister Megan, a practitioner of outlawed moon magic; to mouthy Sir David Agravaine and his two equally dim-witted sidekicks, to an unknown enemy from outside the kingdom bent of destroying it. No matter who the killer is, Eddie’s got his work cut out for him. Mr. Bledsoe knows his noir, and he blends hard-nosed private eye shtick seamlessly with this quasi-Arthurian fantasy setting. Mystery fans will find Eddie’s wry tone entertaining, while fantasy readers are sure to enjoy tracing the slightly warped lines of the Matter of Britain, even while Bledsoe’s ersatz “Merlin” is copping a tune from Jerry Garcia. 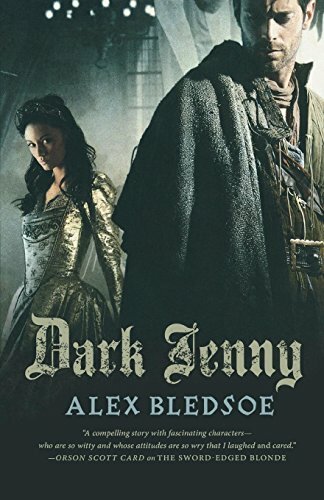 If you’re looking for a mystery with a unique voice and an engagingly familiar-yet-unfamiliar setting, you can’t go wrong with Dark Jenny. Charlene Brusso is a science writer and reviews science titles as well as science fiction/fantasy, mystery, and romance for a number of publications, including Publisher’s Weekly.